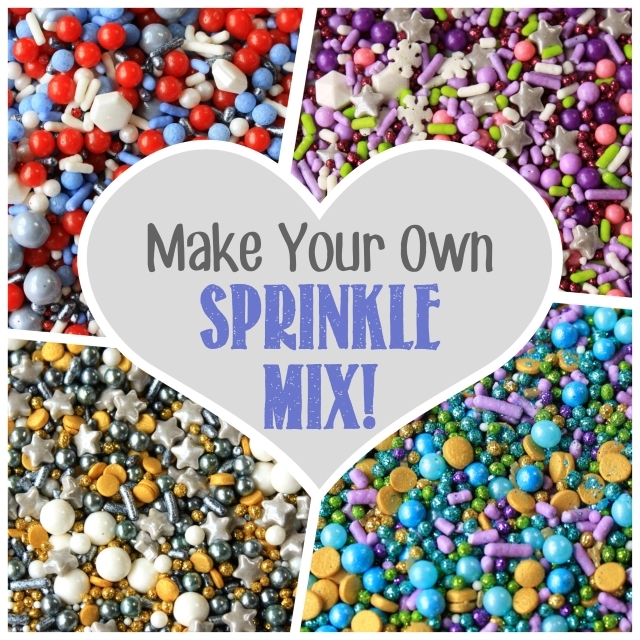 How to Make Your Own Sprinkle Mixes!! Between you and me... how many containers of sprinkles you do *really* own? You don't have to say the number out loud...but don't forget to count that "other" box of sprinkles that nobody else knows about. You know...the one you hid in the back of the closet to make yourself feel better about the sprinkles in the box in the front of the closet. And even if we're finally giving those back-of-the-closet sprinkles the love they really deserve...it's just not the same now that there are FANCY SPRINKLE MIXES on the market, right??!! But don't despair. I've got a fool-proof (ish) system so YOU can use up those "hidden" gems to make your very own fancy sprinkle mixes in just minutes. Or hours. It's actually harder to stop making mixes than I originally thought. The new year ALWAYS sneaks up on me. It's only a few days after the biggest cookie decorating holiday of the year. 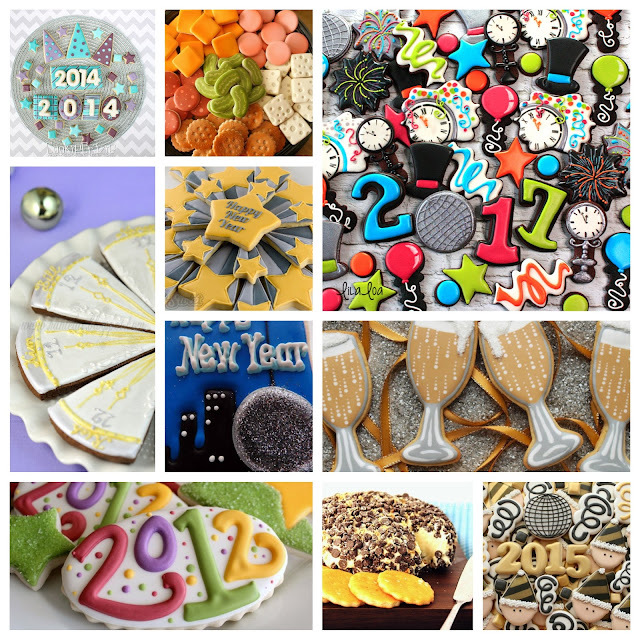 So I decided to put together a list of some of my favorite New Year's Eve cookie tutorials to save you some times this year! 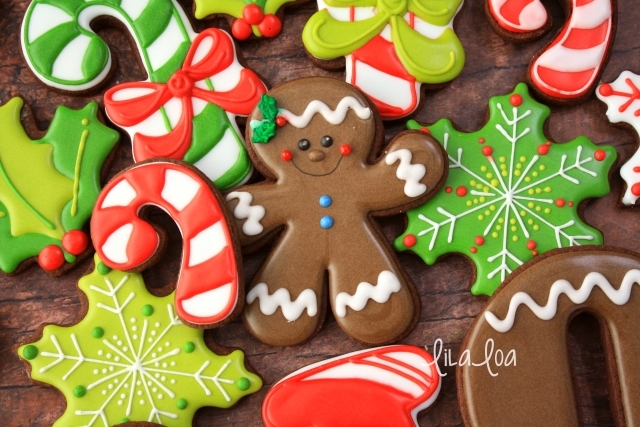 Learn to make decorated gingerbread men in this cookie decorating tutorial! I'm hesitant to declare anything ironic ever since Alanis put one hand in her pocket...but there is a good chance that this one fits. I wanted to give you guys a suuuuuuper quick and easy design to ease your late-night stress and last minute orders. So I baked up these gingerbread guys late at night along with another order I was making. And in my late-night-early-morning-who-even-knows-at-that-point-of-the-day haze... I weirdly iced them all white. I have spent absolutely MINUTES this holiday season observing the holiday gift opening behavior of those around me. And I've come to the conclusion that it can be narrowed down to two distinct styles. On one side of the dichotomy we have people who graciously accept gifts and then inexplicably take them home without even peeking and put them under their tree to open on Christmas!! No one is even watching them and they aren't peeking. It's like some kind of Survivor Challenge of discipline and self control. You guys. I hope you are ready for this...because today is OUT OF CONTROL!!! Don't forget to enter the DAY SIX giveaways HERE and HERE. They end at midnight tonight! Don't forget to enter the DAY FIVE giveaways HERE and HERE. They end at midnight tonight! Don't forget to enter the DAY FOUR giveaways HERE and HERE. They end at midnight tonight! Don't forget to enter the DAY THREE giveaways HERE and HERE. They end at midnight tonight! Don't forget to enter the DAY TWO giveaways HERE and HERE. They end at midnight tonight! Don't forget to enter the DAY ONE giveaways HERE and HERE. They end at midnight tonight! Can you believe we are already on DAY FIVE??! Let's not waste our precious Monday morning minutes. Shall we get right to it? 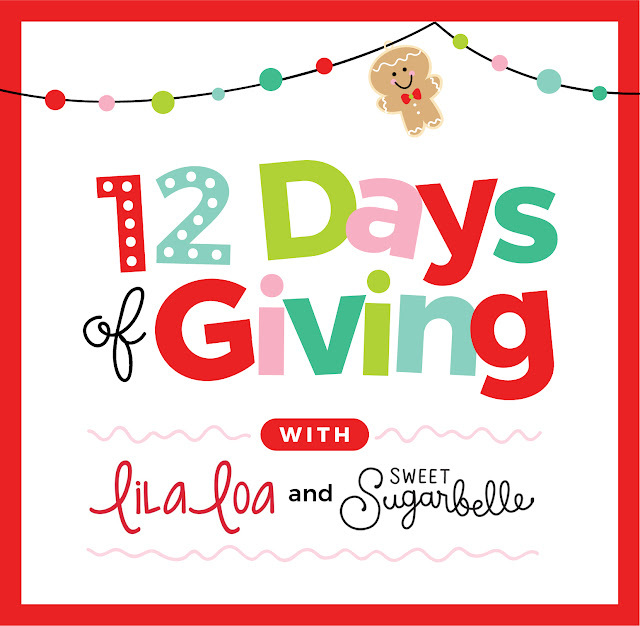 The Fourth Annual 12 Days of Giving with LilaLoa and Sweet Sugarbelle -- DAY TWO!! Ooooh. Let's just get right to this today!!! The Fourth Annual 12 Days of Giving with LilaLoa and Sweet Sugarbelle - DAY ONE!! 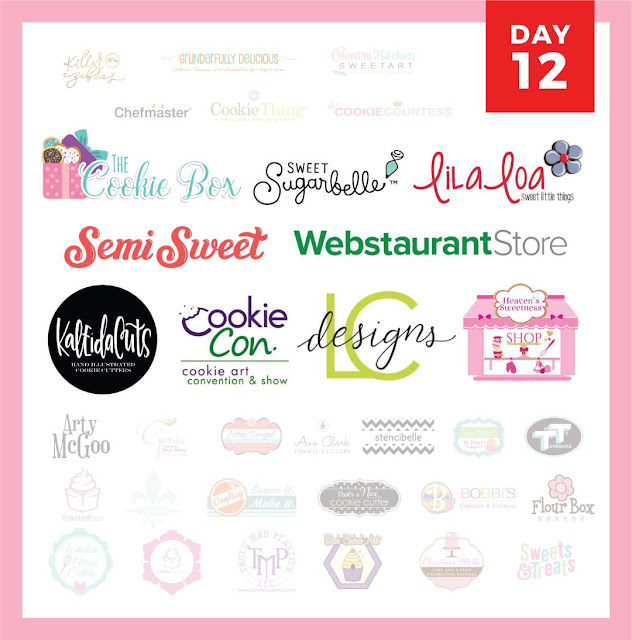 Can you guys believe this is the FOURTH annual Twelve Days of Giving with LilaLoa and Sweet Sugarbelle?! I love you guys. 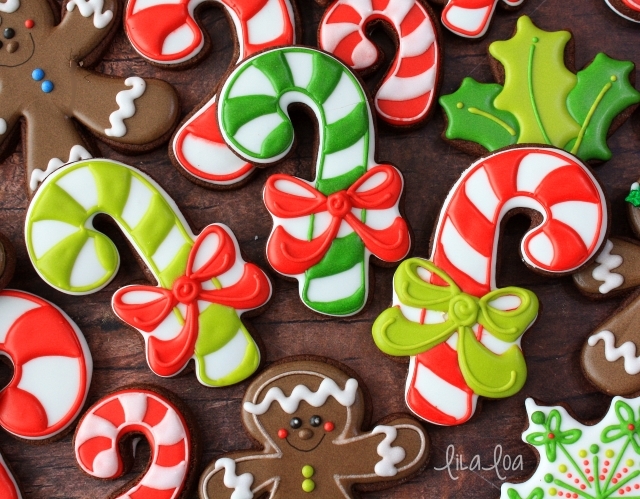 Callye and I have been sharing our cookie decorating journey with all of you for over seven years now and STILL my favorite part is that I get to connect with so many amazing people all over the world. YOU GUYS are the reason I make cookies and share cookies and create tutorials and videos and never do laundry...actually that last one is on me. But all the rest -- THANK YOU!! This is our way of giving back for all that you give to us!! !